Can anyone confirm if they know if the Titanic Blu-ray will come with a UV copy? Its Paramount so it would make sense but I can't find any confirmation of it. When other movies from Paramount let you choose Vudu, Amazon, Itunes, and Windows Media Player. I would recheck the website on the release date and/or check the back of the Blu-ray. I had Titanic in my wishlist on "My Vudu" over this weekend. The movie also showed up in the "coming soon" section of Vudu. Was marked would be available today. Titanic has disappeared from my wishlist and isn't available. Was wondering if Vudu support can explain what happened? Will Titanic be available for purchase through Vudu in the future? According to blu-ray.com, its a UV release, but can't find real confirmation in news articles or anywhere else. Just as a witness for Sandra, it WAS there last week. Now it isn't. I noticed also. I am heading to Wal-mart later today. I will try to take a picture of the back cover if it isn't in a keeper. 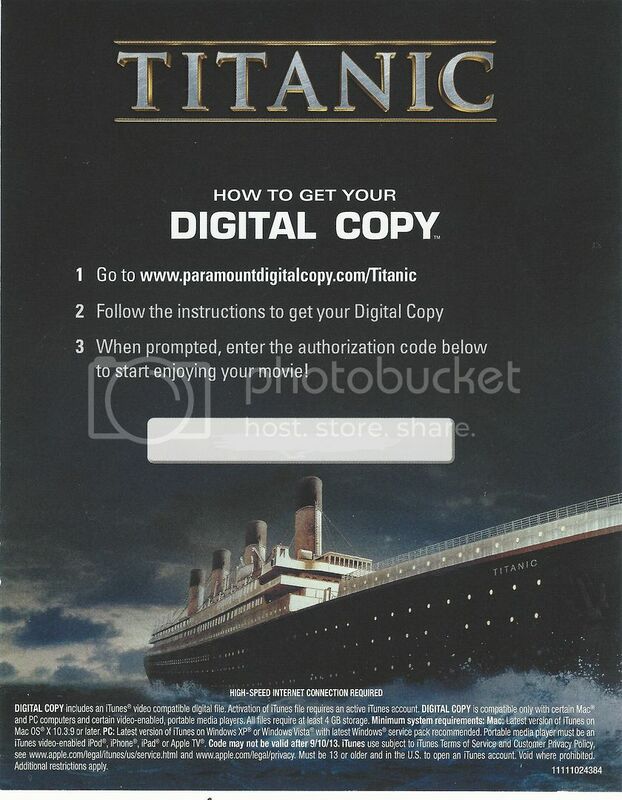 Here is the digital copy insert from Titanic 3D Bluray bought at Walmart for $19.99. I got Walmart to price match Best Buy for $24.99 then I used the $5 manufacturer coupon from the link in the Best Buy ad. I marked out my code. It appears to be iTunes only. I noticed on a http://www.titanicmovie.com it says copyright Paramount and 20th Century Fox. I am going to contact Paramount about this issue. I noticed on Frys website it said it was ultraviolet on the 2D Bluray and dvd they don't carry the 3D Bluray. I can buy a standard version of Titanic on my Amazon account for instant streaming on my Sony Blu Ray player. The HD version is only available to rent on Amazon as of today. I would like to hear from Vudu support here on the forum as to why they advertised it as being available for purchase or rent .... not sure which as of today 9-10 and then pulled it? Thanking you ahead of time for the answer to my questions. Thanks Mike for the information also. The iTunes code is for SD only I sent Vudu an email about it disappearing from Vudu. I also sent an email to Paramount about it. I thought all movies would have Ultra Violet from now on if it said digital copy. The outside package says iTunes only. I just got a response back from Paramount and they said Titanic won't come with an ultraviolet code. I wish Vudu would add it to their movie collection and add to D2D list. They had the movie in their coming soon list to be available on 9-10 and I had it in my Vudu wishlist. My wishlist on my vudu ...not D2D. The movie jacket had HD written on it. It was pulled I guess. I can buy the instant stream of the movie from my amazon account in SD for viewing on my Sony Blu Ray player and can rent the HD version. Not sure why Vudu pulled the movie. I wounder why it is atleast not available to purchase from Vudu. Paramount has been dropping the ball lately. They were first giving out hd, then sd now they are issuing out only itune codes? Not that i'm excited for the movie but its kinda disapointing knowing movies are getting pulled without an explanation. Very disappointing I agree. I was looking forward to purchasing Titanic from Vudu yesterday. It's one of my D2D wishlist movies. I didn't expect the movie would be D2D. I just wanted to buy it either way.